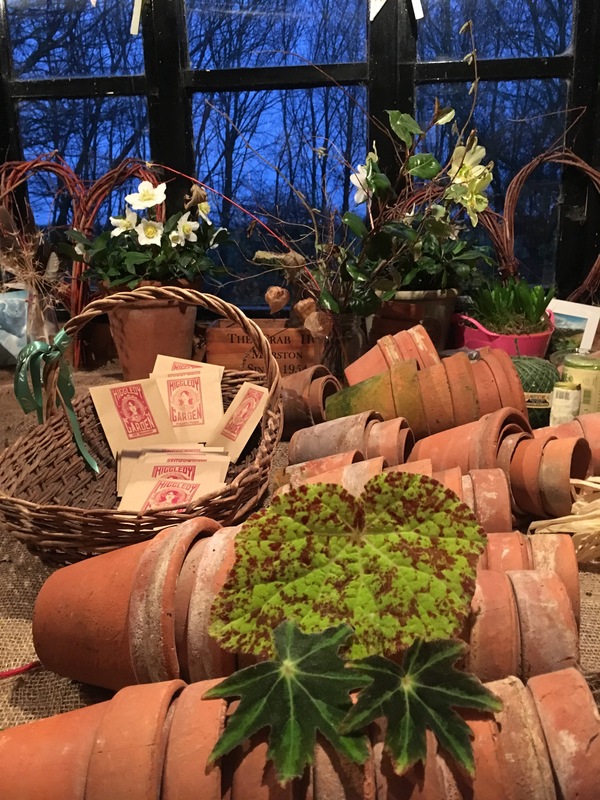 A quick peek in my pottingshed tonight…..
Here’s a quick peek in my pottingshed tonight. I’ve been having a go at begonia leaf cuttings. I’ve never done this before. I had a look on the RHS website. Then I placed the leaves on a chopping board and, using a sharp knife, cut through the main veins. I filled a seed tray with compost, topped with perlite. Laid the leaves on top, and pinned them down with my daughter’s hair grips -the only wire I had in the house. Sometimes you just have to improvise. I put the seed tray in my Rainbow shallow trug and left it to soak up water. I’m finding these trugs really useful in the pottingshed. I use them for collecting foliage for flower arrangements, and as a moveable potting station when I’m sowing seeds. My cuttings were popped into a plastic bag and into my propagator. The best time to take leaf cuttings is in the summer. But when a friend gave me these leaves, I couldn’t turn down the chance to have a go. You never know- they might grow lots of new little plants. Then I’ll pot them up into 7cm pots- and display them at the shaded end of my greenhouse. I’ve always loved the foliage of begonias. This might be the start of a new collection for me. 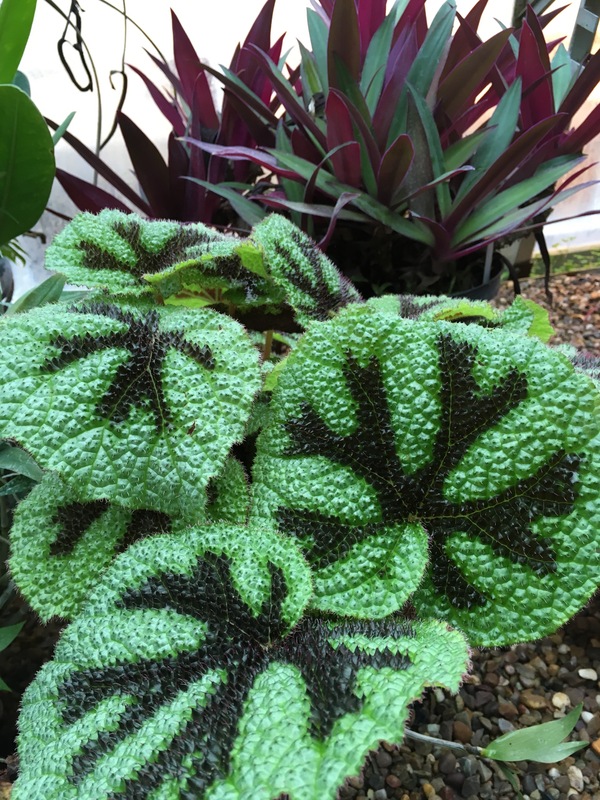 The RHS website says leaf cuttings can be taken from streptocarpus and eucomis as well as begonia masoniana and x Begonia Rex hybrids. I also found the National Begonia society handbook a useful source of information. It was getting dark by the time I’d finished. I just had time to look at these snowdrops on the pottingshed window. They’ve burst into flower today. Such a cheerful sight on the last day of January. Have you tried any new gardening techniques recently, or have any collections of favourite plants? I’d love to hear about them. Great post. I am trying to get Jade plant cuttings to take. The books says they are easy but mine are so slow I fear they won’t make it! Have you put the pot in a plastic bag, Brian? That might help. All the best with your cuttings. Just keep trying. I never give up- even if I am a little unconventional with my techniques and timings. I find that if I fuss over something and do it by the book- it sometimes fails. When I’m in a hurry, and having to make do- it often works. Hi Karen, all the experts said not to use a plastic bag with pelargoniums as they were more likely to rot! 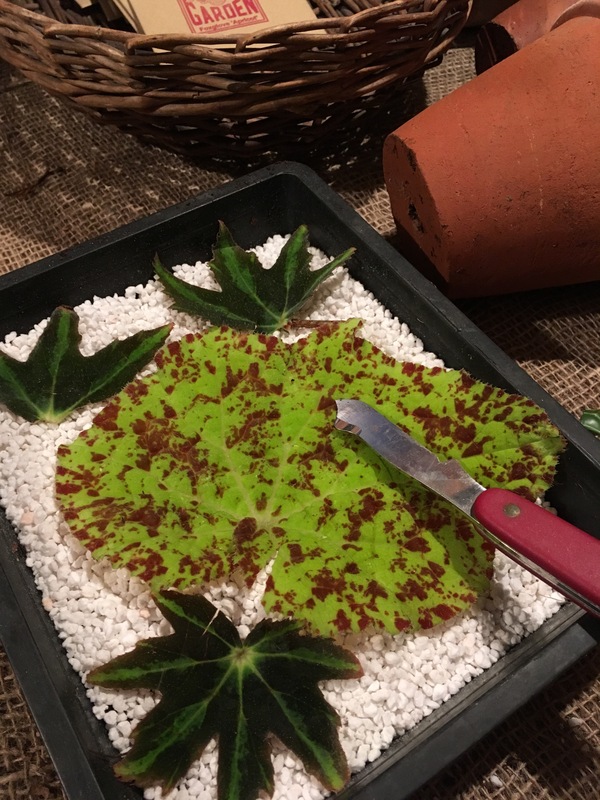 [J] Begonia leaf cuttings were our first ever non-seed propogation, circa 1979. It’s so exciting isn’t it. To think we are able to get new plants just from one leaf. Plants are amazing. I’m trying root cuttings of Perovskia for the first time . I wasn’t sure the plant would like to be moved so thought I would try a few root cuttings, no sign of life yet though, keeping fingers crossed! Oh, perovskia is so beautiful in late summer. Such a gorgeous blue. You are right though- it hates being moved. I do hope your cuttings take off. I often mist spray mine with seaweed extract, and that seems to kick start them. And any sign of mould, I spray them with diluted cinnamon water.Such a useful spray now there are no commercial treatments like chesthunt compound for damping off for seedlings, and mould in cuttings. Thanks for taking the time to read and comment. It’s much appreciated. I tried putting the stem of a shrub in water and waited for some roots to appear, not really believing they would and it worked, takes a while though. Good luck with your leaves. I can confirm it works for streptocarpus. Good luck! They are amazing those leaves aren’t they. Definitely worth having a go at this time of year. Yes I’ve got some streptocarpus which I’d like to try the technique on. Its almost magical that you can get plants that way! It is like magic! I’m eyeing up my streptocarpus leaves at the moment. We had a terrible attack by vine weevils, so they are quite diminished. I’ve treated the soil with nematodes and they have picked up quite a bit. But I am thinking of starting afresh with leaf cuttings. Thanks for taking the time to read and comment. All the best with your garden. Anemone root cuttings just beginning to show new growth, very exciting, first successful attempt. it really is. my kids wind me up hugely about my general giddiness when something like this happens. I take the mocking, content in the knowledge that all this is waiting for them in 30-odd years!